A full body size with a solid spruce top and mahogany back and sides. 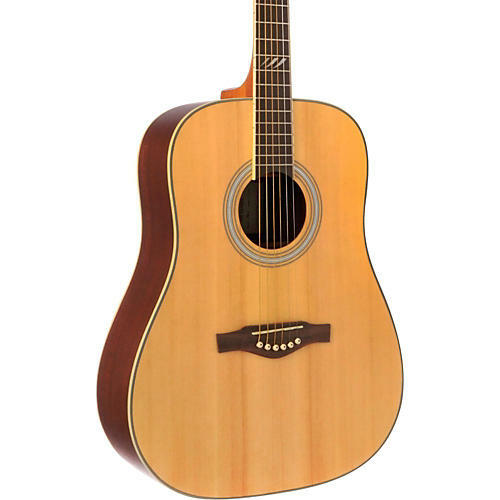 The TRI Series Dreadnought Acoustic Guitar combines a spruce top with mahogany back and sides with rosewood fingerboard and bridge. This wood combination provides a penetrating sound, precise and powerful. This series offers the most demanding musicians a selection of guitars Solid Top designed in order to have great performances, and can bring anything you want on the stage. The musician, the instrument and the sound, an indissoluble Trinity. Case sold separately. Get a guitar with a great pedigree. Order today.